Obviously I have chickens and love them, but chicken keeping isn't for everyone. I had a lot to learn when I first started raising chickens and I really wish someone would have told me what I was getting into! There are quite a few reasons why you shouldn't raise chickens and if you're not aware of (and prepared for) the issues ahead of time, it can make the whole experience rather miserable. 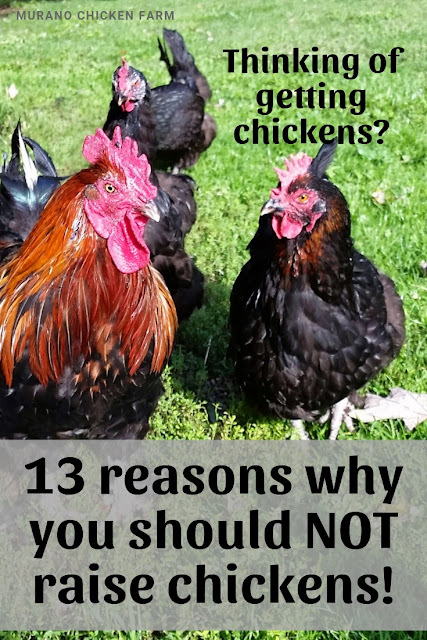 I wrote 14 Reasons why you should not raise guinea fowl back in 2014, they were not a real popular type of poultry back then and I had learned a lot about raising the quirky birds. All these years later I think it's high time I explain exactly why chickens may not be a good idea for everybody. Of course I think everyone needs some chickens in their life. They just come with a few uhhh, surprises! 1) They will destroy your landscaping. Chickens enjoy bugs and have no qualms about uprooting flower beds and ripping out freshly laid mulch to get to them. It's just what they do. You can either fence the flowers in or the chickens out, but they cannot coexist without damage. 2) Chickens are not cheap! Many people start thinking about raising chickens because of the 'free' eggs, the those eggs end up costing a LOT more than you bargained for! I think our first coop cost around $1500 in supplies alone. That seems to be about average for a new coop big enough to house a dozen hens. I probably spent another couple hundred on supplies like feeders, drinkers and the whole brooder set up. Then I had to buy the chicks, bedding and feed! You can easily end up spending a lot more than you bargained for. 3) You may still have to buy eggs even after your chickens start laying. In the beginning you have to wait 4-6 months for eggs. After that broodyness, molting, the winter break, illness, predators and more can cause your hens to not lay eggs for awhile. In all there are 11 reasons why your hens might not be laying eggs. Predators are always a problem for chickens as they are pretty low on the food chain. It's not just a country issue either, though things like foxes, hawks, coyotes and fisher cats are more of a problem in rural locations. Even in the city or suburbs raccoons, cats, dogs and even snakes, squirrels and opossums can be a problem. Sadly this means that there is a good chance that you'll lose a chicken to a predator at some point. Chicken feed can attract things like mice and rats to your chicken coop or feed storage area. 5) You'll need to clean the coop out and it can be heavy work. You'll have to clean the coop regularly. Depending on which method you use, it may be once a year with the deep litter method or every week with the regular way. While the deep litter method sounds amazing because of that once a year thing, the coop litter is 20 times heavier at that point! Either way it's going to need cleaned out. 6) You might not be zoned for chickens. This is one of those things that you'll need to find out before you get chickens. Although many people have been able to get ordinances changed in their areas, it's probably best to try to get them changed before your invest a bunch of money into a coop and equipment. 7) You'll need to lock them up every night. Many predators come out after dark making it especially important to lock the chickens up by nightfall. This sometimes means coming home early unless you have a door with a timer. I can't even count how many times I've said "I have to go lock the ducks up". Elaine from Sunny Simple Life just made the tough decision to part with her chickens for this very reason. 8) It's much harder to go on vacation when you have chickens. Many of us hire chicken sitters in order to go on vacation without worrying the whole time. Some people just simply don't ever go on vacation. Still other load their chickens up with feed and water and go away hoping for the best. Whichever method you choose, owning chickens means you now have to consider them when you make social plans. 9) You will have chicken poop everywhere! Chickens poop wherever they are. They just don't have the control nor the desire to hold it. 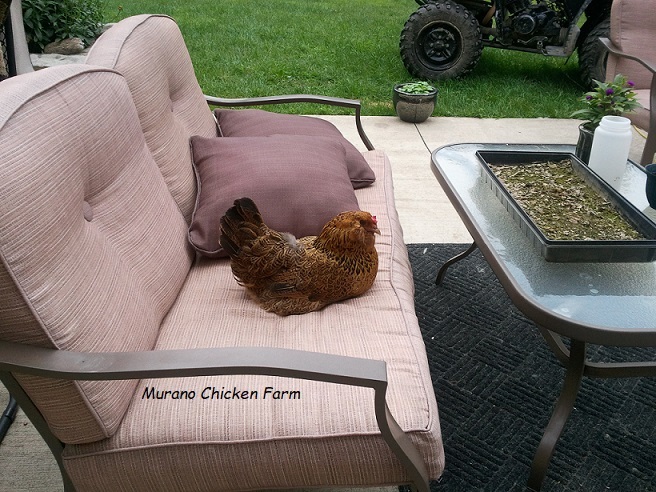 Chickens are smart and will learn that people have treats and like to hang out where they see you often, like by the front door or near the car. You'll start finding poop everywhere they've been. On the porch, in the driveway, on the front walk. Everywhere! 10) Chicken vets aren't a thing. Regular livestock veterinarians generally won't see your chickens if the chicken gets ill. Your small animal vet usually will not see a chicken either. You'll need to take your chickens to an avian veterinarian which are harder to find and often expensive. This means that chicken medical care is often a do it yourself project. 11) There are very few medicines made for poultry. Since you'll be doing much of your chickens health care by yourself you'll need to buy new medications for each issue that arises. Unfortunately there aren't that many medications made specifically for chickens. This means you'll be buying medications for other livestock or humans and adjusting the dosage for your chickens which can be tricky. 12) You might have to put one down. Some regular veterinarians will put down a chicken in extreme cases, but more often they will not. Will you be ready to cull a chicken when the time comes? 13) They stop producing as many eggs in just a few years. 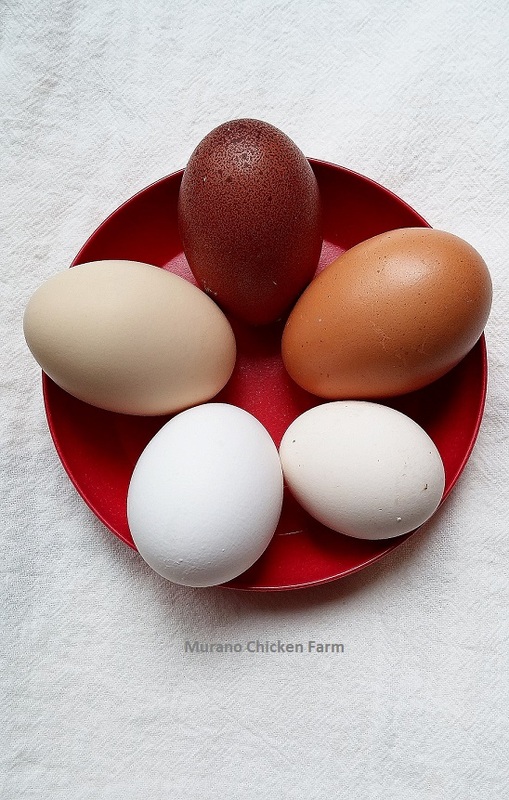 After about 3 years, egg production in most hens slows down drastically. At this point you'll need to decide if you want to continue to feed a freeloading hen, or if she's destined for the soup pot? Believe it or not, I'm not trying to talk you out of raising backyard chickens. I think everyone should have them! I just wanted you to be aware of the downside of raising chickens before you commit to them. All very good points. I have adopted many a chicken from owners who did not consider many of these points. I can't tell you how many people think that if you have chickens that you should be able to take on someone's rooster. My last two 'adoptees' were thrown into my yard in cardboard boxes. One other point to consider: have an exit plan for your hens if you will be moving. Either figure out the laws involved in moving them out of state with you or have a solid re-homing plan. Also, please don't hatch eggs as a learning experience for children unless there is a home for every chick - many of which will be roosters! That's crazy! What kind of person thinks it's ok to just dump roosters on your property? Glad you gave them a good home.